OECD News: Worldwide Corporate Tax Taxation – quo vadis? According to BEPS Action 11 “Measuring and Monitoring”, the OECD has released a new report that provides data regarding corporate taxation developments from around 100 countries worldwide. Along with the report, the OECD has published a new database, which is now publicly accessible and allows for studies of international trends in corporate taxation. On a global scale, corporate tax accounts for about 13.3% of a country’s total tax revenues in 2016 – a figure which has grown from 12% in 2000. In Europe and the US, however, the situation is different. In 2000, the corporate tax revenues amounted for about 8.4% of total tax revenues. In 2016 this figure remains stable at about 7.2%. When comparing corporate tax revenues as percent of GDP, the figures rose from 2.7% (2000) to 3% (2016) worldwide, while the data suggests a decline from 3.1%(2000) to 2.6% (2016) in Europe & US. In general the trend seems to be that corporate tax rates are declining. According to the OECD, national statutory tax rates fell by about 7% on average. While more than 60% of all included jurisdictions had statutory tax rates of at least 30% in 2000, only 20% of all countries had a rate equal or higher to 30% in 2018. Of the 94 jurisdictions, 76 have lowered their statutory corporate tax rates, compared to only 6 jurisdictions that have raised it and 12 that have held their corporate tax rate. In 2018, the data shows that 12 jurisdictions have either no corporate tax regime or a corporate income tax rate of 0%. It has to be considered that these data do not refer to the effective corporate tax rate, which, on average, tends to be even lower than the statutory corporate tax rates (about 1.1% according to the OECD report). 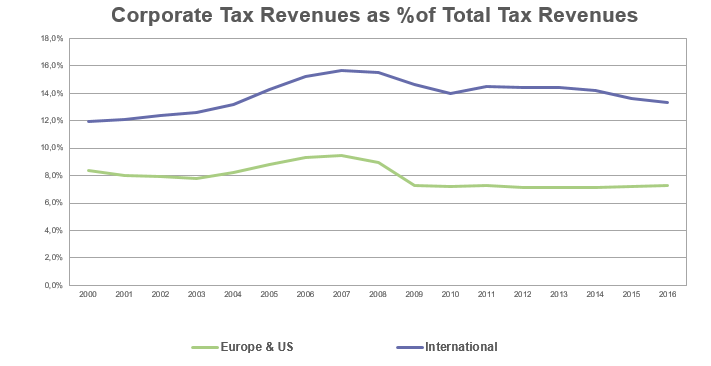 The overall trend suggests that corporate tax rates still amount for an important share of a jurisdiction’s income, but are more important in countries outside of Europe and the US. The new database assists in the study of corporate tax policies and will help to improve the measurement and monitoring of base erosion and profit shifting. In future, the OECD will also include aggregated and anonymized statistics of data collected under country-by-country reporting, which will allow for a better assessment of effective tax rates actually paid by companies in the years before.